COTTAG3: It's been happening to me...finally! It's been happening to me...finally! I love reading blogs for ideas but I'm often frustrated because all of you seem to find these great pieces for nothing or next to nothing in thrift stores, yard sales, curbside, etc., and then you transform them into beautiful pieces that frankly leave my mouth hanging open. I can't seem to find these things. The only thing curbside in my neighborhood is trashcans. Well, I guess my luck (or skill?) is changing. I've found a few things lately that I'm kind of excited about. I think I have about 5 projects in the works. Last weekend, we went to the Bowie Trade Days in Bowie, Texas. I found these mirrors below. There were two of them and they cost almost nothing. My husband thought they were the ugliest things. He doesn't read blogs. I'm going to spare you a tutorial here. You all have seen many a blogger, much better than me, paint and finish off furniture and write great tutorials about how to do it. So, here's a bit of my process and the final result. Looks better already painted in a light gray. I found a gallon of oops paint at Home Depot for $5. It's enough to last a really long time. Don't be surprised if all of my projects over the next few months are this same shade of gray. I'm taking most if not all of next week off. I'll be out of town for most of it due to a business trip. When I get back, I'll be posting more regularly. 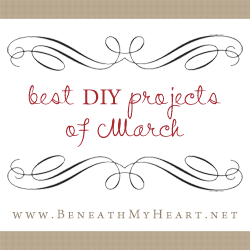 I have a lot of projects going on, some other blogs to highlight, flea markets coming up as well as some ideas for spring. My pal Jennie's been busy too and maybe I can convince her to let me post some things she's been doing. It's really warming up here in Texas and it's been nice to get out and get some things done. I'm linking up to some of my favorite blog parties listed in the link above or down below on the right. I LOVE this. Great find with those mirrors!!! I am ready for warmer weather too, I have way too many projects lined up for this year and warmer weather!!! Oh it's a STUNNING transformation....You should give yourself more credit Lovey....The paintwork is BRILLIANT & doesn't have that FAUX look to it which we all know is a NO NO....Well done....If I were closer I'd be harping at you to sell it to me....hahahahahaha....But I must say though....How CHEEKY of you to place it in a spot where it would 'nonchallantly' reflect your DROP DEAD GORGEOUS chest of drawers....Very VERY cheeky....! Have a GREAT week & enjoy your time away....! that looks gorgeous, gina! love the colors and the design you gave it! Have a great trip! The mirror turned out really well. Love the detail. Holy cow, Gina! Wow! Did you hand do the word on top? So jealous if you did! wowsa! YOU are saying you don't find good stuff? You're always coming up with the goods! THAT is great. What a neat idea. Can't believe that paint color was somebody's "oops." It's perfect. Can't wait for more gray projects. So what's the hubs got to say now? You should have said, "in your face, sucka!" LOVE IT! I want to paint my bedroom furniture gray and antique it, like you did here, but I have to find a good tutorial (wish you would've shown us how you did it!). I've read a few, but they are all so different! BTW- I'm with you .. . I have a hard time finding mirrors especially. Good luck on your business trip. I have one tomorrow, but thankfully, it's only a couple of days! Gina! It's so pretty! Very cool transformation! The gray is gorgeous. What's the other one going to look like? amazing job on the paint. youre good...yes, yes you are. I know what you mean, I often feel the same way. Glad you know your luck has changed. The mirrors you found are fabulous and I just love the way you have made them your own. Wow, what a transformation. Great find; even greater final result. The transformation is so well executed. Bet hubby doesn't think they are ugly now! This is gorgeous! Love your choice of grey....so glad you found some good junk to have fun with. This is so gorgeous! I love it! The paint finish is perfection! Wow, What a beautiful transformation. I bet your husband doesn't think it is ugly now. Great job! Absolutely perfect makeover! Love the color! i wish i had this for my guest bathroom, i love gray. you did an amazing job. i have a party going on if you'd like to link up. Just Beautiful, I love that shade of grey- wish you knew the name -i would go out and get some- and love the stencil work.. Great Job.. So pretty!! Fabulous job! Would love it if you came and visited my blog sometime!! Love the mirrors! They really turned out nice. Darling! I love the shade of gray (hallelujah oops paint) and think that stenciling is phenomenal. Love the mirror on the floor. Fabulous job! This is a great transformation...calm, quiet and elegant.. love the details! Love it! I just got my free(!) Valspar paint sample in the mail and I chose a grey color and I will be doing my next few projects in grey as well! Very pretty...looks like you found a real gem and made 'er shine! This is gorgeous. You did an amazing job on it and I love it!! It's perfect propped up like that and the reflected stool and chest of drawers are so cool. You rock!! wow. what a perfect paint job. amazing. You did good! I bet your husband is so impressed. Great transoformation. People would line up for that mirror now! Terrific transformation! I really like the gray. I'm visiting from MMS. I'm a new follower, I'll be watching for more makeovers. you did a great job with the paint effects. Headed to Round Top & Warrenton at the end of the month? I'm so looking forward to it. Had to laugh when you mentioned that your husband didn't get the mirrors because he doesn't read blogs. Too true! Yayyyyy for you! It's so nice to see that you're finding things. These things tend to happen in streaks, so just roll with it! What a magical transformation! Never underestimate the power of the paint-over, eh? I would've walked right on by those mirrors in their original state, but what you've done makes me do a double take! Beautiful! Amazing! Love it. What a wonderful find. Your hubby doesn't read blogs? LOL I'm a total believer! This turned out amazing! I'd love to know how you achieved the letters. Beautiful transformation. Love the french words! I'm visiting from Coastal Charm! Love Love Love and so happy for you to have finally scored some great finds. Long may it continue! awww shucks...I was hoping that you would've done a tutorial. That looks awesome!